He began study guitar with various teachers including the Japanese Hirotzocu Kakinuma, a student of Narciso Yepes. He graduated at the Conservatory ” Tartini” of Trieste. He graduated in Economics and Commerce in Turin. He attended the courses of Oscar Ghiglia, Stefano Grondona, Frederic Zigante and studied at the Mozarteum in Salzburg with Edoardo Catemario. With the Orchestra Sinfonica Giovanile del Piemonte performs the Misa Criolla by Ariel Ramirez in the Cathedral of the Principato of Monaco and in other various cities. As a soloist gaves many recitals in Italy and at the Australian Embassy in Paris. As a composer and performer he recorded in:1988 the album Gino Borio, 2007 a CD with the most beautiful mazurkas for guitar, 2011 a CD of music by Spanish and Latin American Authors. In 1982 he wrote the music for the ballet ” The tree of golden apples ” staged by the Dance Group of Ivrea at the Teatro Civico ” G. Giacosa ” of Ivrea. Since 1979 he teaches at the Associazione Musicale of Ivrea, and since 1989 at the Associazione Musicale of Rivarolo. A lot of his students have distinguished themselves for examinations at the Conservatory, competitions and in the professional field. Since 2007 he teaches at the University of the Terza Eta’ of Ivrea. In 2006 and 2007 he took part in Summer Courses at the LMFL Summer courses in Frensham Height and in 2008 at Moreton Hall in England. 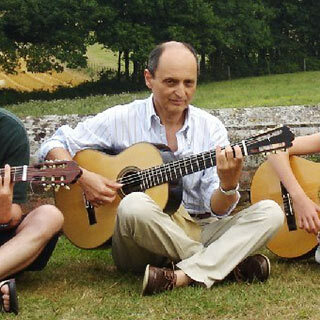 Since 2009 he teaches guitar and Ensemble Music to young guitarists at the International Course of the Accademia del Ricercare in Romano Canavese (TO). Since 2011 he teaches also at the summer courses “Vacanza in Musica” in Castellabate (SA) .. Some of his students are also renowned teachers.